Driving down dark country roads on a Tuesday evening, a full moon shining in the night sky, my partner Tommy and I both let out an impromptu ‘oooo’ when we arrived at The Fountain Inn. 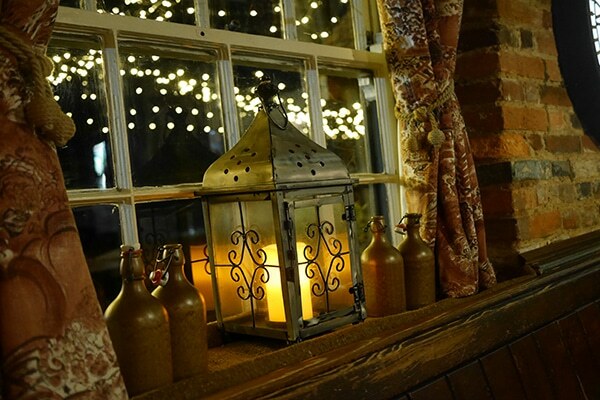 Illuminated by a canopy of fairylights, the pub’s painted façade glowed a rich terracotta-red, while Victorian-style lamps dangled off the adjacent barn. It looked like a scene from a storybook. Pulling up in the huge rear carpark, we found a space between an impressive assortment of vintage cars (the local rally club were visiting), and we wandered around to the entrance. Even in the dark, you can tell that how lovely this pub must be summer, with its choice of gardens and patios, and its lake-sized pond with resident ducks. Visiting in early March, however, we headed inside to the candlelit bar, where a log fire was crackling away in an enormous inglenook fireplace, and the innkeeper Alex Tipping greeted us with a friendly welcome. Instantly likeable, Alex added to the pub’s already charming atmosphere with his warm personality. “Mind if I give you my favourite?” he asked when I ordered a glass of white wine. Taking a sip of the Picpoul de Pinet he handed me across the oak-framed bar, I immediately regretted offering to be the designated driver that night – refreshing, fruity, and reasonably priced, this might just be my new favourite tipple. Even better, if you can’t decide between a glass or bottle, you can order it by the carafe, like many other wines in the pub’s extensive selection. Taking a seat on a round wooden table by the fire, Tommy and I browsed the menu. Meanwhile, Alex chatted to locals at the bar, and his waiting staff buzzed between the bar area and restaurant rooms. 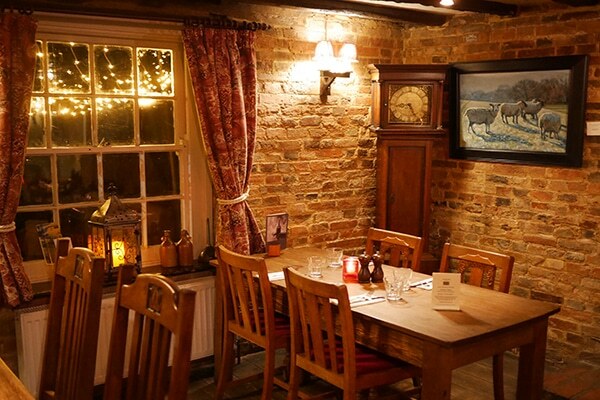 The Fountain has a choice of dining and drinking areas: the original 16th century bar and main dining room at the front, plus a newer extension to the rear. Each room has its own charms but the bar is particularly appealing with its flagstone floor, low ceiling and exposed timbers, which are decorated with horse brasses, a shepherd’s crook, and all manor of memorabilia. Our starters were served by a bubbly waitress who filled us in on one of the Fountain’s claims to fame. “Paul McCartney filmed the video for Wonderful Christmas Time here in 1979,” she told us. “One of our locals who still drinks here said he turned up for a pint one day to find a whole film crew here!” If you do a quick online search, you can still find the original video on Youtube. Humming the Christmas tune which was now buzzing around my head, I tucked into two large sardines served with fresh rocket and a rich tomorrow sauce, Meanwhile, Tommy tackled three meaty sticks of local pork with fresh pear puree. “Can I try a bit?” I asked him, my fork poised ready to poach a piece of his starter. 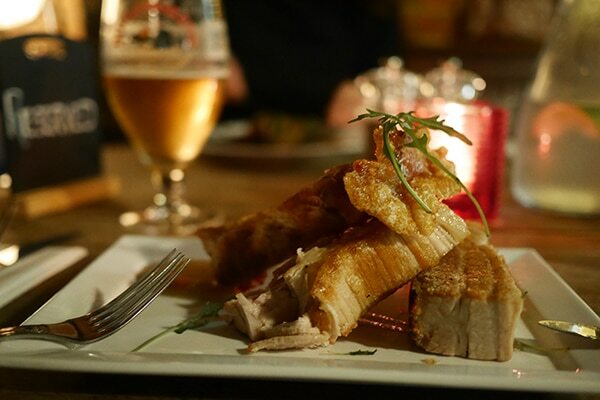 “Not that bit!” he yelped, stabbing at a particularly large piece of crackling-topped pork. Next up was our mains. 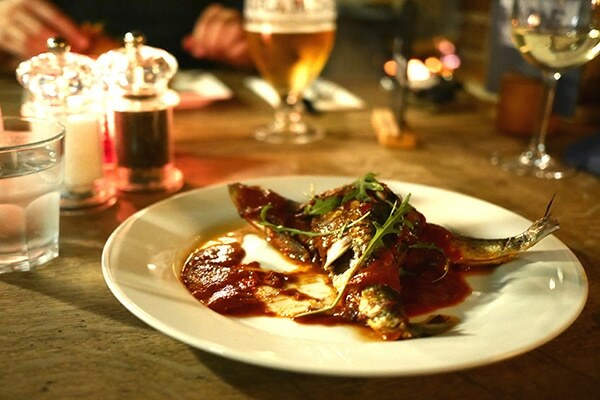 Having deliberated over a choice of pub classics and hearty-sounding dishes like ‘cider-soaked ham hock’ and the inn’s signature ‘Fountain Pie,’ I’d chosen the local ‘fillet of South Coast sea bass’ from the specials board. Cooked to absolute perfection, my fish was melt in the mouth soft, and served with buttery mash and a delicate thyme cream sauce. A truly excellent choice. 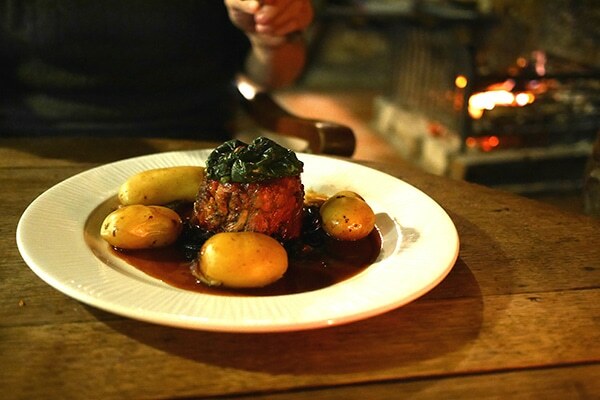 Across the table, Tommy was enjoying an elegant-looking plate of pulled Sussex lamb shoulder, with new potatoes, red cabbage, wilted spinach, and a rich mint jus. 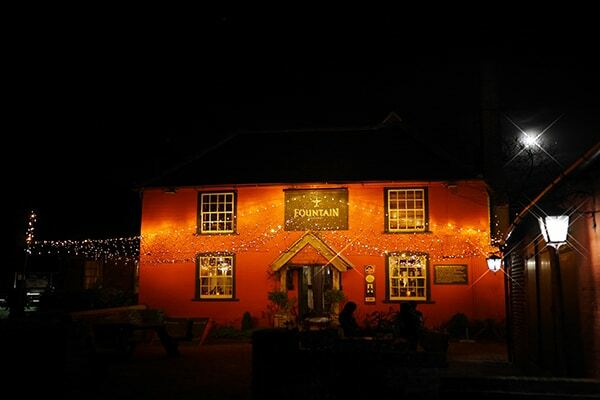 With the smoky smell of the open fire, and the coming and going of local life, The Fountain Inn is the sort of pub that you could easily linger in all night. 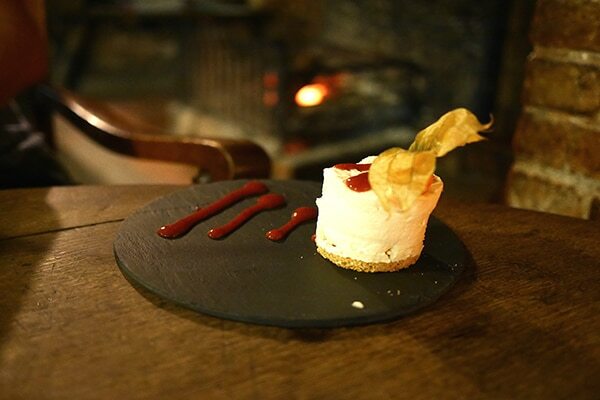 Lulled to stay a little longer, we ordered a couple of deserts to share, starting with a delicious homemade Baileys cheesecake that was flecked with white chocolate pieces and served with a ruby-red raspberry coulis. A definite crowd-pleaser, we ended up sparring with our spoons over the last mouthful. 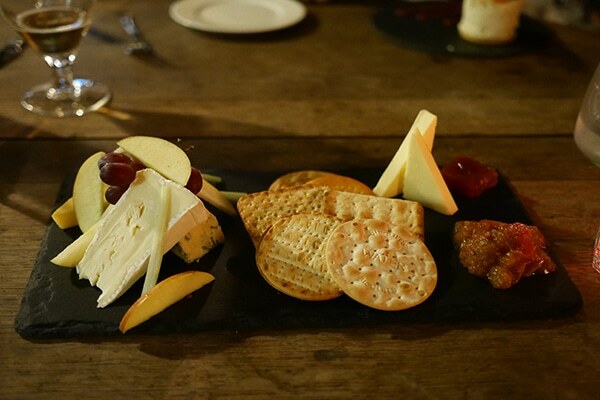 To round off the evening, we nibbled at a selection of Sussex cheeses – my favourite was the smoked cheddar, which tasted even better with a big blob of The Fountain’s homemade chutney. At ten o’clock, we reluctantly tore ourselves away from the pub’s warm glow, and set off for the 25-minute drive back to Brighton. 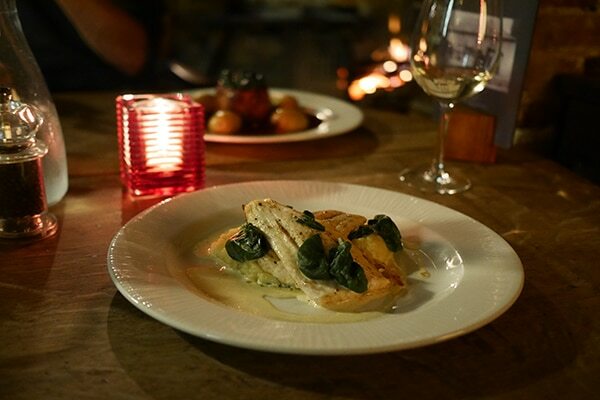 On the way home, we eagerly made plans to return – whether it’s for a ploughman’s on the patio; a Sunday roast by the fire; or a carafe of Picpoul de Pinet by the pond, we’ll definitely be back at the Fountain Inn soon.